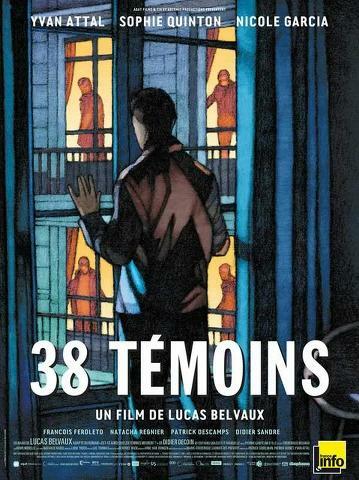 A brutal murder in Le Havre: 38 people must have noticed, but say they heard or saw nothing. A claustrophobic, moving, beautifully shot film with a strong cast including Yvan Attal, Sophie Quinton and Nicole Garcia. A clear picture of what fear and shame do to people. Outside an apartment complex in the French port city of Le Havre, a female student is gruesomely murdered in the middle of the night. The complex’s 38 inhabitants say they heard or saw nothing. Until one of them, the introverted pilot Pierre (Yvan Attal), decides to break the silence. He admits to the police that he was awakened by a desperate, primeval cry. A cry that cannot have escaped his neighbours’ attention. But why did they, just like Pierre, not come to the victim’s aid? Why do they collectively deny having witnessed the murder? Due to cowardice, shame or fear? These questions haunt the traumatised Pierre, and director Belvaux (The Trilogy) states them openly. His book adaptation (the opening film at IFFR 2012) is an unbiased investigation. Why do people tend to want to hush up certain events? 38 Witnesses is a thorough, psychological study and a claustrophobic murder mystery in one. The understated cinematography and subdued soundtrack subtly increase the tension.